The first startling thing you notice about “A Star Is Burns” is that Matt Groening’s name has been scrubbed from the opening credits. Not even very well—when we cut to the TV bearing his name along with James L. Brooks and Sam Simon’s, there’s just a fuzzy blue gap at the bottom where Groening’s name should be. Groening was furious that this episode crossed over with The Critic, a show created by former writers Al Jean and Mike Reiss and produced by Brooks. 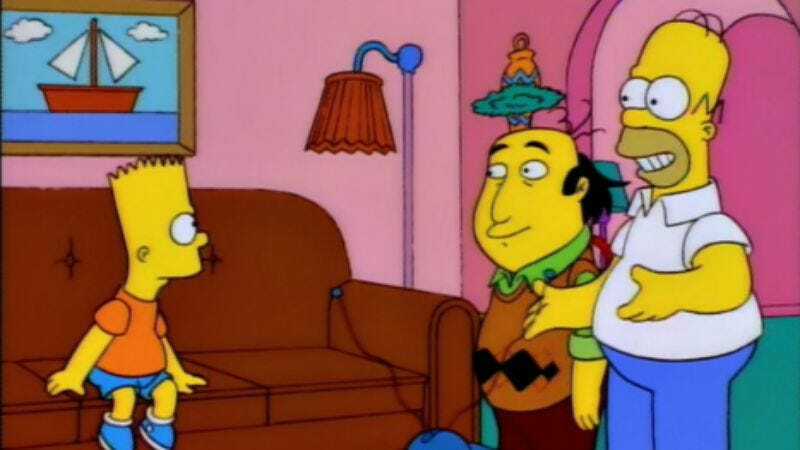 It was beginning its second season with The Simpsons as a lead-in and Brooks had pitched a film festival episode to bring its lead character, Jay Sherman (Jon Lovitz) to Springfield. Groening thought it was hacky and tried to get the episode pulled (a pretty much impossible demand, showing that he either didn’t understand the vagaries of television production six seasons in or just really despised this episode). That didn’t work, so he made a public fuss and had his name removed. The whole thing sounds like quite the brouhaha, and it’s particularly strange considering what a hacky show The Simpsons has become in its old age, crammed with irrelevant celebrity cameos and planning crossovers with everything it airs alongside in the Fox animation block. Should Groening have his name removed from, say, the entire 24th season of the show? I don’t know. “A Star Is Burns” tries to be clever about the forced-seeming crossover, of course. The episode begins with the town worried about its declining status, and Marge’s suggestion of a film festival means that Jay Sherman has an excuse to visit Springfield to chair the jury. Sherman’s arrival is preceded by Bart deriding a crossover episode he’s watching on TV, and then we’re treated to a bunch of blandly funny, disconnected scenes of Jay being a raconteur in the house and making Homer jealous. I’ve never seen The Critic—I guess it passed me by when it aired, even though I saw this episode a hundred times. But I remember even as a kid thinking it was weird to have someone from another show drop by The Simpsons. But while “A Star Is Burns” is one of the weakest efforts in season six because of the jarring nature of the crossover, it still just about belongs in the pantheon just for the ridiculousness of the festival itself. “A Star Is Burns” is very light on plot—there’s no B-story and no traditional turn seven minutes in (that is when Jay Sherman arrives, but the whole episode is very straightforward). Homer’s anxiety about Marge thinking he’s stupid is pretty half-baked and gets resolved without much trouble, and apart from that, time is just given over to the movies. That’s good, though, because that’s where this episode really shines. Then, there’s A Burns For All Seasons, a mish-mash of every Hollywood epic under the sun (I wish we could have seen footage of Tommy Tune playing Smithers). It gets roundly booed, leading Hans to utter this episode’s other immortal line: “I was saying boo-urns,” which has entered the cultural lexicon as a shorthand for weird non-conformity. 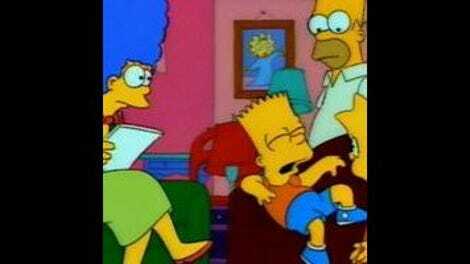 “A Star Is Burns” is not an outstanding episode of The Simpsons, and its plot is deeply unmemorable. Even if you ignore the forced nature of the crossover, it’s an episode that struggles to stand on its two legs. But it still features a ton of incredible laughs. It’s sometimes difficult to examine an episode like this critically—I have seen it countless times and can recount so many of its lines at the drop of a hat. Airing in the sixth season of The Simpsons is like batting on a murderers’ row in baseball—the protection you get from the episodes surrounding you is enough to be remembered fondly. “Marge, are we Jewish?” “No, Homer.” “Woo hoo!” Homer immediately produces a whole pig in one of the episode’s most surreal and best gags.